By the people of Brighton, for the people of Brighton - the old Music Library, a triumph over hubris? This is one of my favourite places in Brighton, a throwback to the good old days when people opened up closed or derelict buildings for creative use by the community. "The building now in use as the Music Library was erected in about 1925 as an office and showroom for the Brighton and Hove General Gas Company, on the site of the Pavilion Baptist Chapel. This chapel was designed by Thomas Cooper in Ionic style and opened as the Trinity Independent Presbyterian Chapel in about 1825, but in about 1896 it was converted into a bazaar and then a warehouse." "New private members club opening for Brighton's creative crowd. "The Media Pool is a new private members club that will cater to the media and creative industries in Brighton. It will comprise of three floors with adaptable spaces designed for business meetings, quiet working and relaxing. There will also be a dining room offering fine dining and bar area." Endorsed by the Fanshawe (nuff said then, and I've already used the word hubris three times) and with gushing articles in the Argus about how glamorous film stars would soon be flocking to the town - sorry, "city", it epitomised all that was rotten in the state of wannabe London-by-the-Sea. And then it never happened. The building lay empty and rotting until the last year or so, when it's been used for some of the most groundbreaking art shows you'll wish to find. 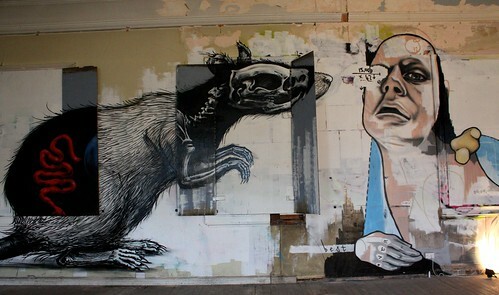 On three floors, using the building's nooks, crannies and huge expanses of wall, it's currently home to a show of darkly humurous imagery (giant crows, rats, twisted religious iconography) and the home to underground events like the magnificent Blind Tiger Club. Rumour has it (well, we all know how Brighton rumours are) that there are plans to develop it into a restaurant. In the midst of a recession? I know that Brighton's showing few outward signs of hardship, but don't we have enough of those poncey eateries with bleedin Jubilee Street Zilli's, bolloxin Jamie Oliver in the Lanes et al? How about a venue which provides a space for genuine creativity, run by the people of Brighton for the people of Brighton, not by a cabal of council-backed luvvies or reality tv arrivistes? Today's cinema-going experience is frequently one of being trapped in an overpriced chav-hole, mobiles bleeping and the rattle of ice in cups of Coke. Maybe some people still subscribe to a notion of the magic of cinema-going, but it seems that idea largely belongs to a past long gone. QueenSpark Books' latest project conjures up that golden era of cinema-going from the 30s to the 60s, in the book Back Row Brighton, which came out this week. It's hard to believe now that Brighton has had over forty cinemas in its time, with just the ghastly Odeon and Marina monstrosities and the historic Duke of York's left, due to celebrate its centenary next year. And Brighton (well, Hove actually) has its own notable place in cinema history with the pioneering studios in St Ann's Well Gardens, and the early cinematographic experiments of William Friese-Green. A remarkable number of films have also been made in or feature Brighton, and at Sunday's book launch at the Duke's, Frank Fludd presented a fascinating short DVD he's compiled of extracts from films made between the forties and the early seventies, with famous titles like Brighton Rock, Genevieve and Carry on at Your Convenience, and unknown and often now-unavailable films like the comedy Penny Points to Paradise (Harry Secombe, Peter Sellers, Spike Milligan, Alfred Marks, Bill Kerr) and thriller Jigsaw (Jack Warner, Yolande Donlan, John Le Mesurier). The book doesn't pretend to be a definitive history of cinema in Brighton (check out David Fisher's brilliant website and My Brighton and Hove for that); rather it's oral history testimonies of memories, from the charming - the old dear dancing with the Teddy Boys in the aisles at Rock Around the Clock - to the alarming - being sprayed with pesticide at every screening. QueenSpark's also produced an illustrated 2010 calendar to coincide with the book, featuring 'then and now' pictures. What's saddest is to see how these beautiful Victorian and art deco structures have been ripped down and replaced with 70s and 80s slabs of grim concrete. 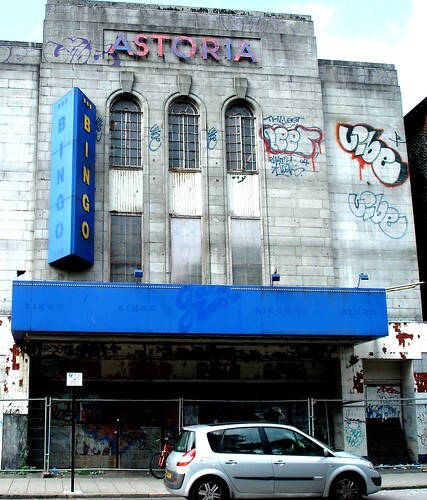 At least the Astoria (pictured above, closed since 1977) has been preserved thanks to its art deco interior, but the longer it remains closed, the more the fabric of the building deteriorates. Maybe cinema-going would be a more magical experience today if we still had such magnificent places to enjoy the latest Harry Potter epic or Bruce Willis masterpiece.